Purchase this product in 10 secs. Currency € Euro Lei cu TVA RON лв Лв. -Knitted fabric without side seams. Due to the high elasticity of the materials and the structure of the article, the individual body shape is preserved. In addition to the absence of side edges, the other edges forming the product are made in such a way that they do not bother the body in any way. LASTING Agata transports moisture from the body by transporting it to .. LASTING Aura is a high-quality thermo leggings- transports moisture fr..
Womens Fleece Jacket HI-TEC Lady Henan is extremely light and warm and..
Thermo blouse HI-TEC Rico Wo s of high quality materials, suitable for cold conditions.. LASTING Angelina transports moisture from the body by taking it to the next layer of clothing, or directly evaporating into the air. .. 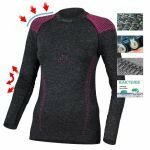 LASTING Atala is a high-quality thermal blouse - transports moisture from the body by transporting it to the next layer of clothing or directly evaporating into the air. ..